Welcome to Pacific Gas and Electric Company's (PG&E) Kilarc-Cow Creek Hydroelectric Project Website. This is an information resource for the parties interested in the decommissioning PG&E’s Kilarc-Cow Creek Hydroelectric Project (FERC No. 606). 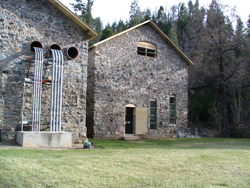 The project is located in Shasta County, California along Old Cow Creek and South Cow Creek. The project consists of Kilarc Powerhouse and Cow Creek Powerhouse along with related canals, penstocks, forebays and other structures.